The Nebraska Emergency Management Agency reported that as of March 20 more than 80 percent of the state was under emergency declaration orders, including 77 counties, four tribal nations and five special government areas such as unincorporated townships. 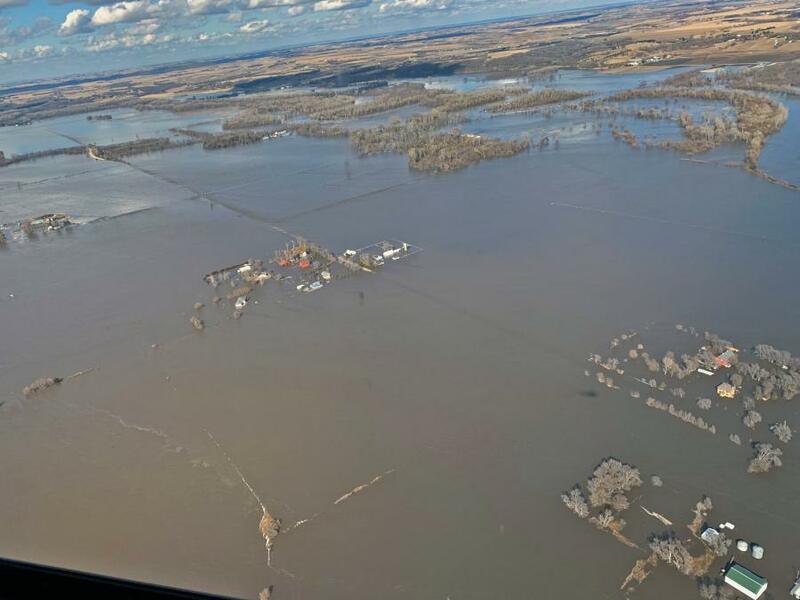 A "bomb cyclone" that struck the Midwest in mid-March caused major flooding across Nebraska and parts of Iowa and Missouri, damaging highways, roads and bridges and causing in excess of $1 billion in property losses, according to news reports. "This past week will forever be remembered for the historic, devastating flooding our state experienced," Nebraska Gov. Pete Ricketts (R) said in a statement on March 19. "In scope of reach, we believe it is the most widespread natural disaster in our state's history. Recovery will be a long road, but I know that together we will get through this. As Nebraskans, we will get through this together as we always have." The flooding, caused by heavy rains occurring simultaneously with melting snow, was exacerbated by chunks of ice swept along by the waters that damaged buildings and infrastructure, the NEMA said. Nebraska National Guard helicopter crews resorted to dropping hay to cattle stranded by the high waters to ensure they didn't starve. "The large amounts of snow and ice resulting from the region's recent winter weather have melted and swelled rivers, creeks and other inland bodies of water throughout the region," the agency said in its statement. "Historic flooding throughout the region [witnessed] rivers rising to historic levels in over 40 locations, causing power outages and breached dams and levees." MoDOT also issued a reminder to motorists on March 20 not to drive around road closure signs as "flooded roadways can be more dangerous than they appear because the road may have washed away or collapsed under the water. In addition, the water may be deeper than it appears and can hide hazards such as sharp objects, electrical wires or chemicals." "Many of these roads are in dangerous condition, impacting the safety of Ohio's drivers," the governor said in a statement. "By declaring a state of emergency, Ohio can now access federal funding to help with the unplanned costs to repair the highways damaged by heavy rain and flooding." For example, the Federal Highway Administration provided $10 million Emergency Repair or ER funding to the Tennessee DOT on March 15 to cope with roadway damage caused by "historical rainfall" in 72 counties this February. The Ohio DOT received $4.5 million in ER money from the agency on the same day to help repair State Route 376 after a landslide caused by heavy rains forced it to close in late February.